If you own an iPad and Apple Pencil, and have a desire to create beautiful designs by utilizing your iPad as an "all-in-one" design device, then this online course taught by Karin Newport of @ipadlettering and Amanda Arneill is for you! In iPad Bootcamp, you will learn everything from the basics - like the best apps and Procreate 101, to the practical - like using your iPad as a beautiful bullet journal, and to the advanced - like creating a full, custom wedding suite and how to get your stunning creations from your iPad screen and on to paper. After this course, the only limits to the creative possibilities available to you with your iPad will be the limits of your imagination! CLICK HERE TO LEARN MORE ABOUT iPAD BOOTCAMP! The amazing Karin Newport (@ipadlettering) is back again to teach us her iPad ways! With iPad Watercolor Wonders, learn how to create realistic watercolor lettering and art all on your iPad with your Apple Pencil. Karin has done all the experimenting to save you the time and hassle! Learn how to achieve the perfect, textured watercolor paper using your iPad and how to get the realistic flow and color effects just like you would with real watercolors. Go step-by-step with Karin and Amanda as you learn to create a plethora of art and lettering watercolor projects on your iPad and how to print your creations to achieve optimal results. Get all the watercolor reward without any of the mess! CLICK HERE TO LEARN MORE ABOUT iPAD WATERCOLOR WONDERS! There's nothing like the beauty of watercolor lettering. The vibrant colors, the blending, the way the brush glides across the page... if only it was that easy. Let me show you different things you should know about lettering with watercolors (the materials, the techniques, the blending... oooh that gorgeous blending!). Then artist Fiona Moes Pel joins me to teach you all about botanical watercolors, wreaths and embellishments to take your piece from just being letters to being beyond belief! 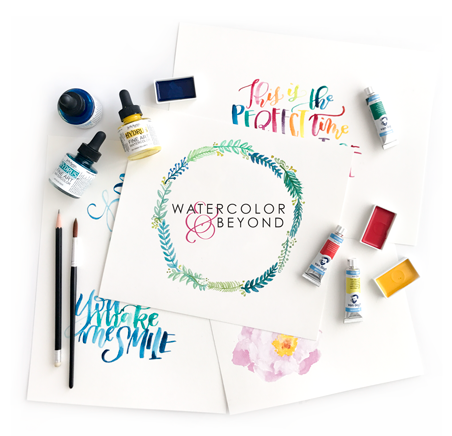 CHECK OUT WATERCOLOR AND BEYOND NOW! Once you have the basics mastered, there comes a point where you can only do so much and go so far. Enter the Intermediate Masterclass! 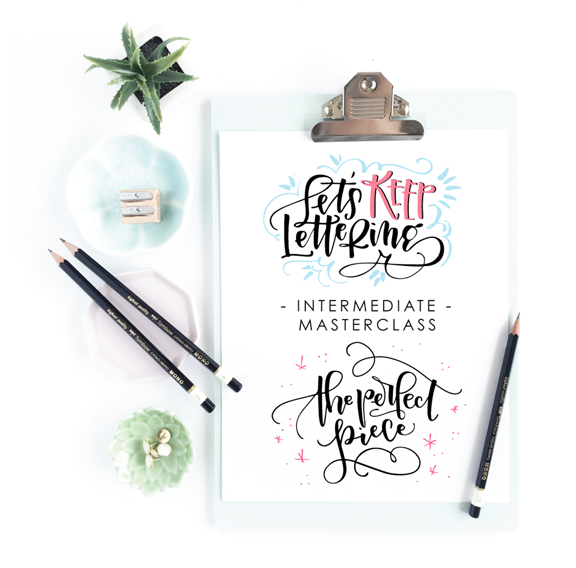 This course combines The Perfect Piece and Let's Keep Lettering Intermediate Courses with personalized feedback and support and extra live video lessons to take this from a regular course experience to something so much more. With registration opening only a few times a year, this course takes you further in 7 weeks than you've come in the last 7 months. Welcome to the Cadillac of online lettering courses. LEARN ALL ABOUT INTERMEDIATE MASTERCLASS HERE! Those amazing piece that you're doing with your pen are stuck on that paper. In Digitize Your Designs we free them from the page so that you can manipulate them for perfect social sharing, isolate the letters for photo creation and, finally, vectorize those letters so that the possibilities for them are endless. Let's take your gorgeous lettering and make it jump from the page to become printable items for your store, artwork for you to share or simply the perfect piece to adorn your own wall. 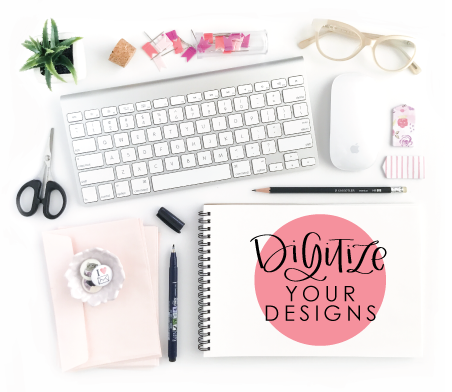 CLICK HERE TO LEARN MORE ABOUT DIGITIZE YOUR DESIGNS! Want to make your time with your Bible or in church more meaningful? Use your natural desire to doodle, draw, write and create to dive to a new level of intimacy with God. 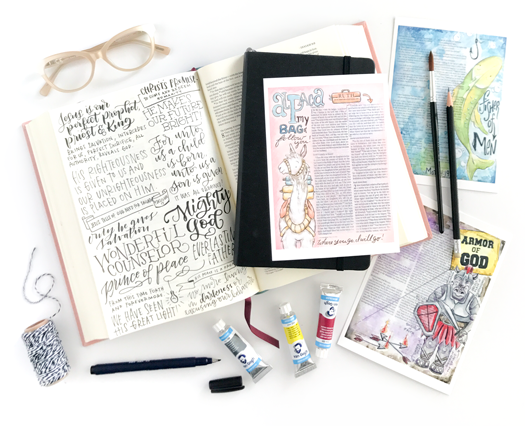 FIND OUT MORE ABOUT THE SCRIPTURE CREATIVE ONLINE COURSE NOW! This mind-blowing course will have you looking at lettering in a completely new way - with no borders or limits. Unlike a regular iPad lettering course, the skills you will learn in this course will take you from someone who plays around with lettering to a complete lettering wizard. Don't be restricted to paper and pen ever again! 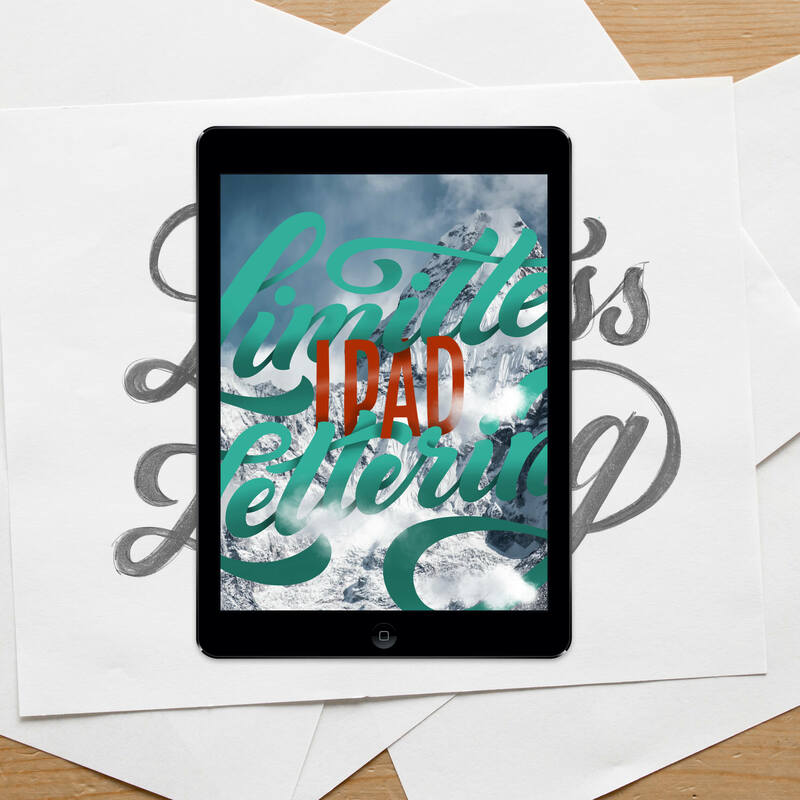 GET YOUR SPOT IN LIMITLESS IPAD LETTERING NOW! From lettering for fun to creating a business, my students have done it all! "I can't believe how far I've come in the last 6 weeks... my entire mindset approaching a piece has changed and the difference styles that I'm now able to use make it so much more fun!" "In the last couple of weeks I have gotten in so many orders and my IG followers have almost tripled in 10 days - I can hardly believe it! I am printing invoices every day and my kids tell me that everything looks so "professional." I couldn't have done it without Amanda and her courses!" "Next to marrying my husband, taking this class was probably one of the best decisions I made! Hahahaha exaggerating much? I think not! As everyone says, this class is worth every penny! If you're on the fence just do it! You won't regret it. It's an amazing investment!!" "I loved the whole class, I learned more than I knew I was capable of doing and want everyone who wants to improve their lettering to take it!!! It's worth every. Single. Penny! And then some. "